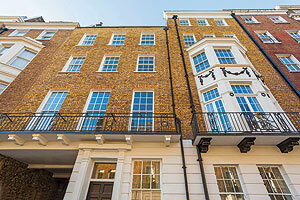 Since 1866, the former homes and workplaces of many of London’s distinguished citizens have been graced by the presence of a blue plaque attached to the building, giving both Londoners and visitors a feel for the history of the streets of the capital. Shamedly, a Bent memorial plaque has never been placed at 43 Great Cumberland Place, London! From the late 1870s until Mabel’s death in 1929 (Theodore died in Number 13 Great Cumberland Place in 1897), the Bents lived in Great Cumberland Place, London, a Regency/Georgian sweep of properties, a stone’s throw from Marble Arch, and for nearly twenty years they would leave their comfortable London residence together every winter for the hardships and inconveniences of travel in the Eastern Mediterranean, Southern Arabia and Africa – greater contrasts it is difficult to imagine. Originally the Bents leased Number 43 Great Cumberland Place, with its adjacent mews entrance passing underneath their drawing rooms, until the early 1880s, following which they moved closer to Marble Arch, again leasing, at Number 13. At Number 13, the Bents were in the habit of putting on small exhibitions of archaeological and ethnographic finds from their travels – including the famous and iconic soapstone birds taken from ‘Great Zimbabwe’, now back in Africa. Both Theodore (1897) and Mabel (1929) died in Number 13. Number 13, alas, has not survived, but Number 43 has! Its elegant and understated facade can be passed in a few paces, but a glance up at the doorway, windows and upper storeys may still reveal the figures of the Bents – in their famous Ulster coats – either preparing for, or returning from, very far away places: Great British travellers indeed. It’s high time a discreet blue memorial plaque saluted them at Number 43! If you would like more information, contact info@tambent.com. You can read more about London’s blue plaques on the English Heritage website.